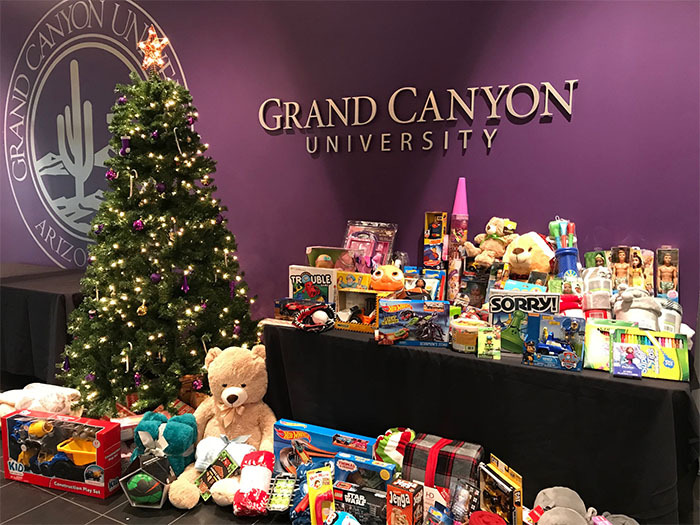 Starting today through Dec. 12, GCU will be collecting new toys for children of all ages, as well as items for adults, including household wares, personal care items, blankets and tools. “When Grand Canyon University steps up to make a difference, things happen!” Phoenix Rescue Mission Community Relationships Officer Pamela Morrison said, and now is our time to join the PRM mission in easing the burden of families in need of hope, healing and transformation. Last year, almost 18,000 people in Maricopa County were homeless — 40 percent of them in families. During a season that brings joy to so many of us here at GCU, our aim is to help spread that sense of merriment to children and families whose desires closely mirror ours … a sense of stability, the hope for prosperity and the gratification of peace in one’s heart. For the second year, GCU will support the Phoenix Rescue Mission Christmas Winter Wonderland Event from 8 a.m. to 2 p.m. Saturday, Dec. 15, at the Community Solutions Center, 1801 S. 35th Ave. On this special day, the community is invited onto the PRM campus to rejoice in the season. Those who would otherwise go without celebrating Christmas due to financial strain will be greeted with a carnival-like environment where they can just have fun together. You can be part of creating this wonderful Christmas experience in several ways. Volunteer your time — openings throughout the month of December: Phoenix Rescue Mission’s abundance of volunteer opportunities include the Winter Wonderland event and also many openings at their Hope for Hunger Food Bank at 5606 N. 55th in Glendale. The number of families being served at the food bank is increasing daily, so your contribution of time would be welcome and much appreciated, and could also serve as a meaningful holiday team builder. The food bank shifts are from 8 a.m. to noon Monday through Thursday, during which volunteers engage with clients and families receiving food boxes. To explore openings, click here to visit the PRM Volunteer Hub home page, and set up your online profile. To schedule a group volunteer event, email Jayna Watts. Champions on the court — attend GCU women’s basketball game on Dec. 11: The women’s basketball team takes on Portland State with the goal of defeating more than its on-court opponent. The Lopes also will be hosting special guests from PRM that will include employees, volunteers and, most importantly, clients who are working hard to transform their lives and combat the foe that is homelessness and poverty. Attend the game, meet representatives from PRM and drop off your toy or household gift before cheering on the Lopes. For more information or to request a collection box, email GCU Community Outreach Manager Debbie Accomazzo. To learn more about Phoenix Rescue Mission’s work in providing Christ-centered, life transforming solutions to persons facing hunger and homelessness, visit their website. Thank you for finding your purpose through partnering with the Phoenix Rescue Mission and touching the lives of so many in our community.